Russia has been stepping up its involvement in the Syrian civil war - culminating in airstrikes last week that may have targeted not just ISIS, but also rebels opposing Syrian President Bashar al-Assad. Meanwhile, the Syrian refugee crisis continues unabated, with a massive influx of Syrians overwhelming Turkey and Europe. To address this, lawmakers and presidential candidates alike - including the president's former secretary of state, Hillary Clinton, say the U.S. should respond with a no-fly zone, which is not a tactic President Obama is willing to pursue right now. 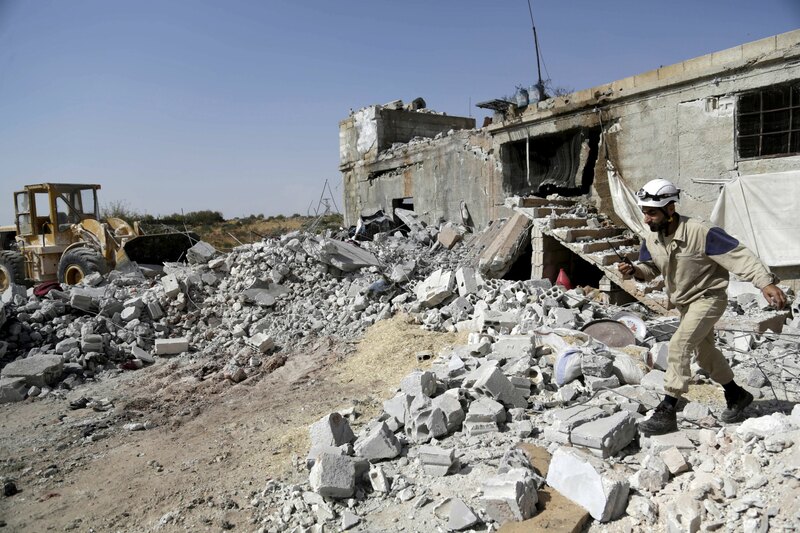 A no-fly zone, proponents say, might help create a safe area for Syrian civilians and protect them from the flying IEDs known as "barrel bombs" that Assad's government has been dropping on them from helicopters and military planes. How would a no-fly zone work? In 2013, Anthony Cordesman, of the Center for Strategic and International Studies, suggested in an article that the U.S. could use long-range U.S. surface-to-air missiles to carve out a space in Jordan to train Syrian rebels or create humanitarian zones in Turkey and Jordan. But he warned those smaller steps might not prove effective to change the course of the war. "For a no-fly zone to work, it has to be at least serious enough that Assad cannot fly fighters or helicopters without losing them and without losing his air bases if he persists," Cordesman wrote, saying it would require fighters, aircraft, drones and other intelligence and reconnaissance assets to enforce. It would, he warned, also possibly entail U.S. combat losses. But those were the options in 2013. Russia's recent military buildup, including an active air base, "creates a major potential barrier to U.S. or allied no fly or security zones in Syria and forces every rebel faction to consider the risk of engaging Russia," Cordesman wrote at the end of September. CBS News Senior National Security Analyst Juan Zarate said the U.S. should respond to Russia's recent actions by accelerating its own strikes, and it should initiate discussions with Turkey and other regional allies to create a no-fly zone and no-drive zone to help refugees and U.S.-backed fighters on the ground. That would force the Russians "to consider what we're doing in a more aggressive way," he said, and could involve confrontation with Russian troops on the ground. Who supports a no-fly zone? Republican and Democrats alike are coming out in favor of a no-fly zone. Recent supporters from the 2016 presidential field in addition to Clinton include Ohio Gov. John Kasich, New Jersey Gov. Chris Christie and former Hewlett-Packard CEO Carly Fiorina. Clinton has long been an advocate of more aggressive methods to bolster the Syrian opposition, putting her at odds with President Obama at times. Last week she said, "I personally would be advocating now for a no-fly zone and humanitarian corridors to try to stop the carnage on the ground and from the air, to try to provide some way to take stock of what's happening, to try to stem the flow of refugees in an interview with Boston television station WHDH. After Mr. Obama criticized "people offering up half-baked ideas" about the Syria conflict, he added that that statement didn't apply to Clinton - but suggested their different roles lead to different conclusions about what should be done. "There's a difference between running for president and being president," he said at a news conference Friday. Christie said on ABC's "This Week" Sunday he would "absolutely" implement a no-fly zone in Syria, because "anybody who agrees with allowing the Russians into the Middle East is just painfully naïve." Kasich said in a statement that no-fly zones enforced by the U.S. and Europe would "prevent further escalation and suffering by civilians and refugees." And in an interview on Fox News last week, Fiorina said the U.S. should secure a no-fly zone around the rebels it supports. "This is a tricky maneuver, it's a dangerous maneuver, but it's a maneuver that we must undertake because we must make it crystal clear to Russia, they do not get to move into the Middle East," she said. As for a potential fight with the Russians, she said, "If it does come to that, I think we must be prepared." Other supporters include former Ambassador Ryan Crocker, who said on "Fox News Sunday" he wished the U.S. had established a no-fly zone earlier, which might have helped dissuade the Russians from intervening. But he said it was still valuable to pursue a no-fly zone enforced with offshore missiles, in order to "change the political dynamics." In a hearing on Capitol Hill last month, former CIA Director David Petraeus also said the U.S. has the "capability" of stopping Assad's air force if the Syrian dictator continues to use barrel bombs against his own people. For one, the person who matters the most - President Obama himself. "What we have learned over the last 10, 12, 13 years is that unless we can get the parties on the ground to agree to live together in some fashion, then no amount of U.S. military engagement will solve the problem," he said Friday. Late last month, White House Press Secretary Josh Earnest reiterated that the administration was still not considering a no-fly zone because it raised a complicated set of logistical questions about what would be enforced and what kinds of resources would be needed. The president has less and less company these days. Sen. Bernie Sanders, I-Vermont, said last week that he does not support a no-fly zone because it "could get us more deeply involved in that horrible civil war and lead to a never-ending U.S. entanglement in that region." On "This Week" Sunday, Republican front-runner Donald Trump said his move right now would be to "sit back." "I want to see what happens. You know, Russia got bogged down, when it was the Soviet Union, in Afghanistan," he said. "Now they're going into Syria. There are so many traps. There are so many problems. When I heard they were going in to fight ISIS, I said, 'Great. Let them.'" On CNN's "State of the Union," Sen. John McCain, R-Arizona, a longtime proponent of a no-fly zone, said, "I don't think he understands very well the situation."